Workplace violence is becoming disturbingly commonplace. 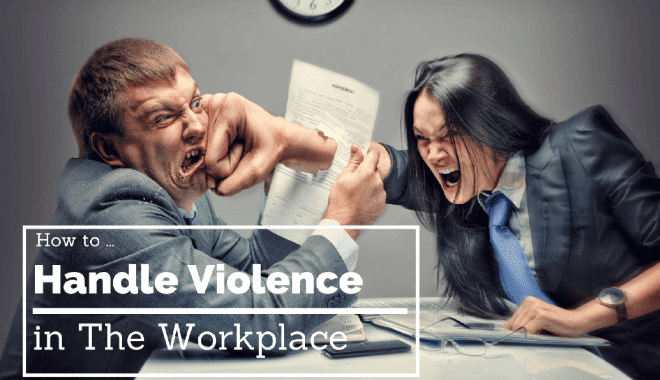 Many times, people equate workplace violence with violent physical acts, but it can also include disruptive behavior, intimidation, harassment, and threats of physical violence. Workplace violence not only involves employees, but also clients and visitors to a job site. OSHA has stated that approximately 2 million Americans are the victims of workplace violence each year, and an estimated 1.7 million employees are injured as a direct result of physical assault. These figures alone are disturbing enough, but how should human resource professionals address workplace violence within their own organizations? Of course, businesses want to provide a workplace that is free of violence for humanitarian purposes, but business owners or partners can face significant legal liability in the event that such an act happens. Who Qualifies as a Vulnerable Employee? Specific professions that are considered exceptionally vulnerable to workplace violence include taxi drivers, retail employees, mail carriers, community workers, and social service workers. How to Protect Employees From Workplace Violence? The best method for protecting your employees from workplace violence to adopt a zero tolerance policy against workplace violence – with no exceptions. Workplace violence committed by, or against, your employees will not be allowed. Each and every employee should understand that claims of workplace violence will be thoroughly investigated, and substantiated claims of violence will result in immediate termination. Many experts in workplace safety recommend, for medium to large businesses, to establish a “threat assessment task force”. The members of this team are responsible for analyzing past incidences of violence in both the employer’s company and similar institutions within the community. Other tasks that the team should be responsible for include identifying conditions, hazards, and operational circumstances that could potentially lead to violence within their specific business. An effective program is going to require the installation and maintenance of closed circuit video monitoring systems, access to proper control devices, and effective communication means, like private channel radios that will enable them to communicate with one another in the event of a crisis. Investments will also need to made into alarm systems and additional lighting for the business’s premises. Of course, there is no one size fits all policy when it comes to dealing with workplace violence. When developing their own policy, each business must create the policy within the context of the particular risks associated with a profession, their facility’s unique layout, and their industry. Unfortunately, even with all of these precautions in place, no business can 100% guarantee the safety of their employees. Although most individuals will never experience an incident, whether minor or major, of workplace violence, it is important to create a plan on how to respond should a violent incident happen. Should workplace violence occur, as a human resources manager, you must provide prompt medical evaluation and medical treatment to any employees who have been victimized. The local police must be called as quickly as possible, and a report should be filed. Victims should also be informed of their legal right to prosecute the perpetrator(s). In the aftermath of the event, you must discuss with your employees the incident itself and encourage dialogue among staff workers as to how to prevent such acts in the future. If the event affects multiple employees or is particularly traumatic, it would be wise to offer professional counseling services to all employees. By taking proactive steps, you will significantly minimize the chances that your employees will be exposed to workplace violence.